I booked a twin room here based on the photos of the hotel and facilities offered. 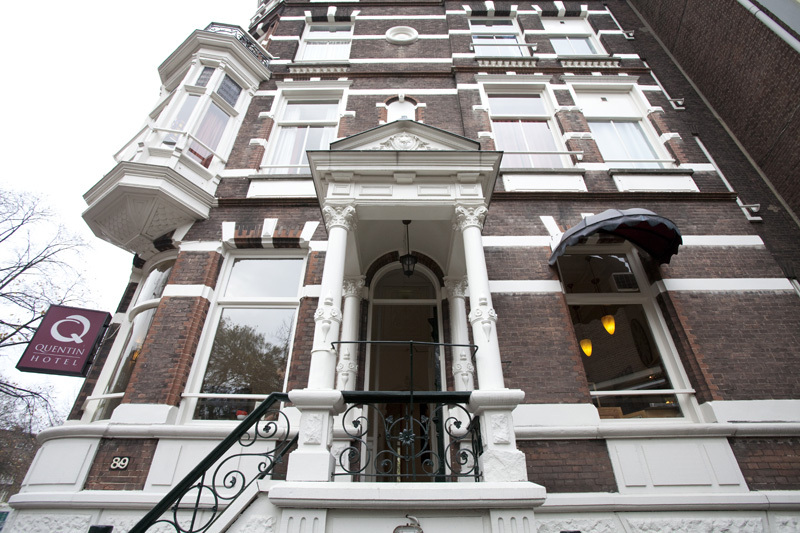 I did think the rooms in the photos were a bit small and basic, but for the price, in the middle of Amsterdam, it looked OK. When we arrived the staff seemed disinterested and slightly annoyed with everybody. This is probably because they had to tell many people who arrived that they were actually not going to be accommodated in the Quentin Hotel, but had to walk around the corner to a nondescript entry into another hotel with dismal narrow corridors, really steep stairs and small airless rooms. No staff, No safety notices etc. Not only did the receptionist casually tell us we weren't staying at the hotel we booked, but he insisted on taking full payment in advance. The twin room we were sent to was much smaller than the one we thought we had booked in the Quentin, with very basic amenities. There were only two small towels in a very small bathroom, with a tiny sink, toilet and grubby shower, all of which could be touched at the same time whilst standing at the sink. I did make a point of telling the staff at reception in the Quentin that I was not happy with being given alternative accommodation with no explanation. I told them that I was not happy with the accommodation, and I asked if there was a discount for the move to the lower standard alternative accommodation. My comments and questions were met with a disinterested, tired, That is the way it is. Take it or leave it kind of attitude. I seriously thought that many of the reviewers of this hotel on this site were exaggerating, or being too picky, about what is basically a 3 star central hotel in a major European capital city, but I would now have to say I agree with most of their negative comments. I could go on, but I suggest that you read and seriously consider the views and comments made by myself and the many other reviews who rate this hotel as terrible. Hotel tip: Don't stay here.